﻿﻿ Now this is one exciting sweepstakes!! There are 5 participants in this awesome sweepstakes! 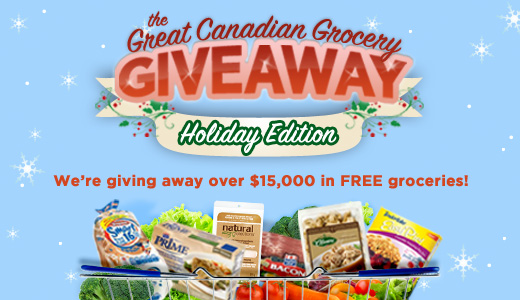 This is the GREAT CANADIAN GROCERY GIVEAWAY. Maple Leaf Prime, Smart Bread Smartman, Olivieri, Tenderflake, & Maple Leaf Foods are all involved in this sweepstakes! You can enter via all their sweepstakes links on facebook for 5 chances to win daily!! Click The Links Below To Enter The Sweeps! (Remember To Enter Them All!!) Maple Leaf Prime Smart Bread Smartman Olivieri TenderflakeMaple Leaf Foods Prizes Available Below: GRAND PRIZE: One (1) Grand Prize will be awarded consisting of a cheque issued to the Grand Prize Winner for eight thousand six hundred and two dollars ($8,602) CDN. WEEKLY PRIZES: The Promotion consists of nine (9) weekly drawings. Each weekly prize consists of a cheque issued to each Weekly Winner for seven hundred and eleven dollars ($711) CDN See Official Rules. Click Here To Vote For My Babygirl To Win This Contest! If You Like This Post, Share With Your Friends & Don’t Forget To Join Samples N Freebies N Deals On Facebook!